Brownian motion is the random motion exhibited by a particle suspended in a fluid (either a liquid or a gas). Particles experience a random force from the constant bombardment of the particle from all sides by the constituents of the fluid, and a dissipative force due to drag from the motion through the fluid. Using the equipartition theorem and Stokes’ law, one can derive an equation for the mean-squared displacement of spherical particles over a period of time that depends on the temperature, viscosity, and particle radius. Particle-tracking software can analyze videos of ensembles of particles and identify particles, track their motion through the fluid, and do statistical analyses on that motion. Brownian motion can be used to measure the viscosity of a fluid, or if the viscosity is known, can be used to estimate the Boltzmann constant. Alternately, particle-tracking can be used in complicated systems (e.g. inside cells) to study non-diffusive (non-Brownian) behavior. Many research groups (including those in the fields of biophysics, soft matter, and glassy dynamics) use microscopy and particle-tracking software in their labs, and this experiment serves as an introduction to some of the techniques typically used there. More generally, this experiment gives students experience with different common software packages used in professional research groups (e.g. ImageJ and TrackPy) and helps them build universal programming skills by writing and manipulating Python scripts to perform their analysis. 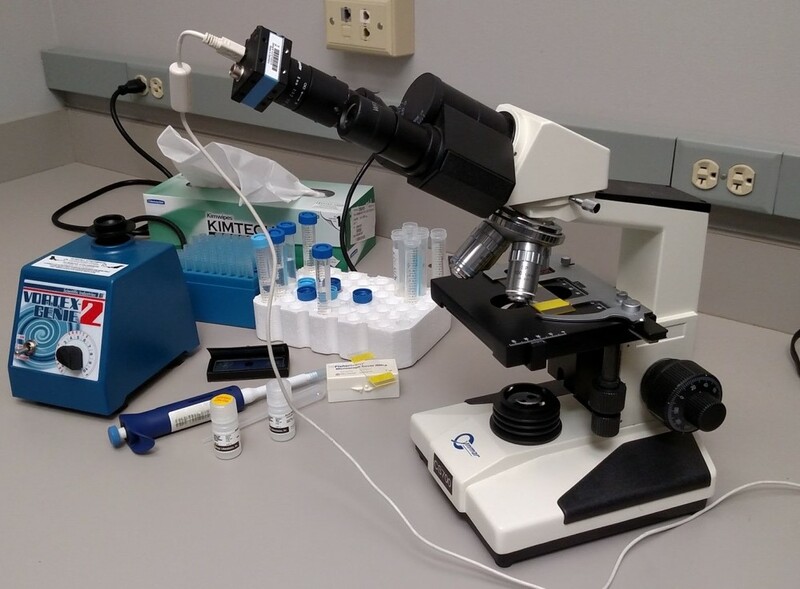 The apparatus for this experiment is made up of a microscope with a CCD camera connected to a computer; microscope slides prepared with a solution of silica spheres diluted in water; and accessories like sample vials, pipettes, and slide covers. If everything were purchased new, the total cost would be approximately $2500. All software used is open-source and free. There are no safety concerns with this experiment. Participants should bring a lab notebook. A desktop computer will be provided for data collection and analysis, but a personal laptop computer would also be useful. In the morning, participants will learn to dilute particle solutions and prepare microscope slides, use the optical microscope and CCD camera, and use the data acquisition and analysis software. Participants will collect several movies of Brownian motion – while manipulating both physical variables (e.g. particle density) and data collection or analysis variables – and will run the analyses in-lab to compute the diffusion coefficient (and therefore obtain an estimate of Boltzmann’s constant). 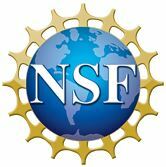 In the afternoon, participants can explore other extensions to the experiment, including studying scaling laws, investigating systematic effects, and working on uncertainty estimation. A full manual for this experiment as it is currently offered to University of Chicago students is available at https://wiki.uchicago.edu/display/phylabs/Brownian+Motion. David McCowan completed his B.S. in 2007 at Ohio University, then continued at the University of Chicago where he received an M.S. in 2008 and a Ph.D. in 2014 based on research in liquid-to-glass transition theory. 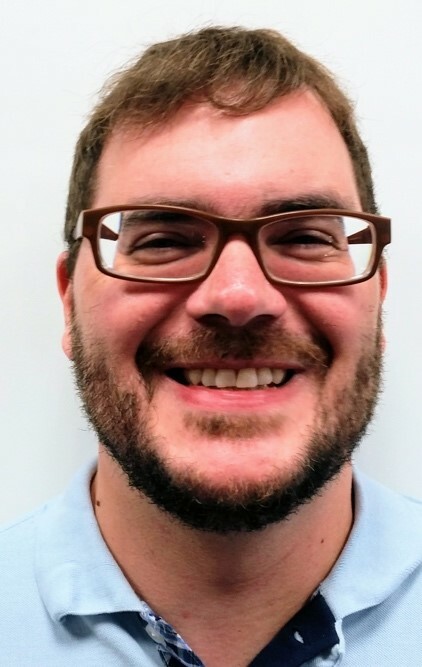 Since 2015, he has been an Assistant in the Instructional Laboratories of the Department of Physics at the University of Chicago developing, maintaining, and implementing introductory and advanced experiments for both undergraduate and graduate students. During this time, David has worked with his colleagues on several projects including incorporating python scripting into the advanced labs curriculum, developing an online wiki of the lab manual and supplementary material, and revamping the graduate experimental lab course structure. David McCowan, Instructional Assistant, University of Chicago, Department of Physics, KPTC 209, 5720 S. Ellis Ave., Chicago, IL 60637. Email: mccowan@uchicago.edu. Phone: 773-702-7012.